Fifteen states and the District of Columbia on Monday joined Hawaii’s renewed effort to broaden the scope of exceptions to President Donald Trump’s executive order on travel. The states are urging a federal judge in Honolulu to rule that the Trump administration wrongly excluded grandparents and other relatives from the list of close family members who can still get visas to travel to the United States during the 90 days that the executive order is in force. A federal appeals court dismissed Hawaii’s first effort on Friday but indicated a way for the state to try again. Lawyers for the state immediately drafted new papers and filed them the next day. After the U.S. Supreme Court ruled in late June that the government could begin enforcing the travel ban in part, the State Department said parents, parents-in-law, spouses, fiancés, children and children-in-law would be exempt from the ban on visas for travel to the United States from six Muslim countries. But grandparents, aunts, uncles, cousins, nieces, nephews and siblings-in-law would be subject to the ban. 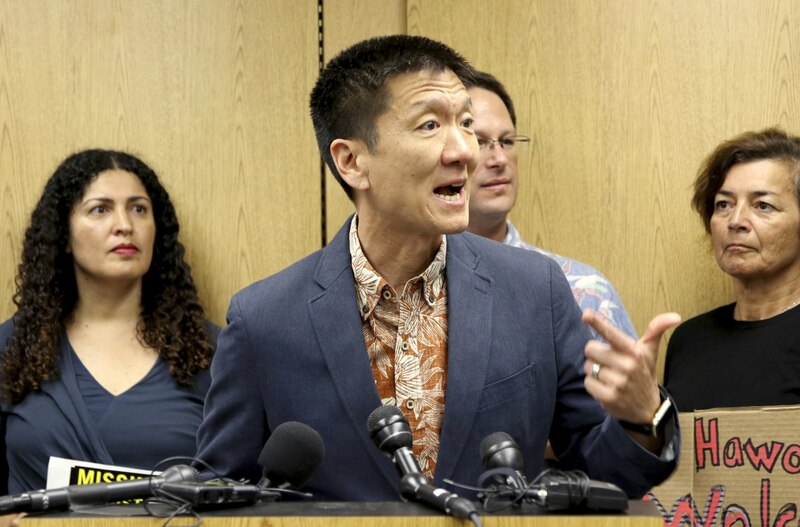 Hawaii argues that the Supreme Court drew a line between visa applicants overseas who have no family connection to people in the United States and those who do have relatives here. The government is enforcing that ruling too narrowly, the state contends. Led by New York, the 15 other states said that when people overseas consider attending a U.S. school or accepting a U.S. job, they consider whether their relatives will be able to visit them. “The artificially narrow line drawn by the federal government will thus likely impair the ability of institutions in the states not only to recruit but also to retain individuals from the affected countries who do not wish to endure the hardship of disruption and separation from family members,” they said in a friend-of-the-court brief. As the government is now enforcing the ban, “an ailing grandmother could not receive end-of-life care from her foreign granddaughter. A niece whose foreign aunt was like a mother to her could not bring that aunt to witness and celebrate her wedding. And an orphaned child would not be permitted to receive a visit from the uncle who took care of her financial and emotional needs after her father’s untimely death,” their brief said. The other states are California, Connecticut, Delaware, Illinois, Iowa, Maine, Maryland, Massachusetts, New Mexico, Oregon, Rhode Island, Vermont, Virginia and Washington. The Trump administration has argued that the Supreme Court’s ruling means that only people overseas with a “credible claim of a bona fide relationship” with a family member in the United States should be exempt from the travel ban. The list of exceptions was based on definitions of close family members included in federal immigration law, Justice Department lawyers said. Final court papers in the current challenge are due Wednesday, and the judge could rule any time after they are filed.